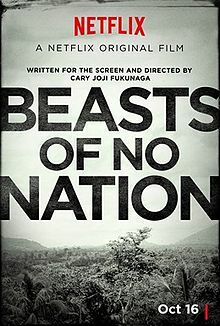 Beasts of No Nation – A Netflix Original Film. The beginning of the end of theatrical releases? Much is being said about Cary Joji Fukunaga’s ‘Beasts of No Nation’ – A Netflix Original Film. The film itself is perhaps not the masterpiece many are taking it for, even though it’s certainly not bad at all. Fukunaga adapted the novel by Uzodinma Iweala, produced and directed the film and also was responsible for the cinematography. Previously he directed ‘Jayne Eyre’ (2011) with Mia Wasikowska and Michael Fassbender and the complete first season of the hugely popular ‘True Detective’. The tone of this film however is closer to that of his directorial debut ‘Sin Nombre’ (2009), dealing with south americans trying to cross the Mexican border into the U.S in search of a better life. Set in an unnamed African country the film follows a child named Agu who gets tangled up in a civil war and is being turned into a child soldier by a character called The Commandant, played by Idris Elba (Stringer Bell in ‘The Wire’), the only name actor in a cast of unknowns. The movie starts off with children playing in the background seen through the empty casket of a televison set. A couple of kids try to sell it claiming it’s ‘Imagination TV’. One kid puts his head through it, ‘It’s even in 3D ‘ he says. The film also ends with children playing, this time in an ocean. In between however we get to see the cruelties you can expect to see in a film dealing with such a subject matter. Whereas an undetermined setting worked perfectly well in e.g. Ingmar Bergman’s ‘Tystnaden’ (The Silence) (1963) and ‘Skammen’ (Shame) (1968) here it creates a distancing effect which I found not helpful for the film at all. The location photography however is aces. Another plus is the above average respect the film shows for other languages (as did the Netflix series ‘Narcos’) which is not always the case in american funded productions and does add to the realism of the film. In the scenes involving the Idris Elba character The Commandant the predominant language is english however. Simultaneously with the release on Netflix, the film received a limited theatrical release in the U.S. Otherwise it could not be taken into consideration for the Oscars, which is probably the only reason for the theatrical release to begin with. Manny theaters boycotted the film. When you look at the upcoming movies which Netflix is planning on similarly releasing without necessarily simultaneously releasing it theatrical as well, you can understand the upheavel this is causing for theater chains. On December 11, 2015 it will release ‘The Ridiculous Six’, starring Adam Sandler and Vanilla Ice, a parody on ‘The Magnificent Seven’. 6,7,8 … : So in a short period of time you can see the remake of ‘The Magnificent Seven’ by Antoine Fuqua in theaters, its parody ‘The Ridiculous Six’ on Netflix, and Tarantino’s ‘The Hateful Eight‘ in the cinema’s. March 2016: Pee-wee’s Big Holiday, starring Pee-wee Herman. 2016: War Machine, directed by David Michôd and starring Brad Pitt. 2016: Special Correspondents, directed by and starring Ricky Gervais. I personally would be disappointed not to be able to see the David Michôd (‘Animal Kingdom’ & ‘The Rover’) Brad Pitt film on a big screen. Therefore at present time it’s difficult to say if we should give kudos to Netflix for funding a daring project like ‘Beasts of No Nation’ which otherwise might not have seen the light of day, or blame them for trying to disrupt the business model of the competition. < Previous Pick of the Week: ‘The Diary of a Teenage Girl’. Next > The Lobster. Absurdism to the max.